As physician satisfaction with EHRs continues to lag, experts contemplate how the situation can be improved. Many evenings, Robert Montgomery, MD, churns away documenting the day's patient encounters. While paper used to be king—days Montgomery certainly doesn't long for—EHRs are now commonplace, a development he believes has altered the routines of many physicians and other clinicians. Perhaps not always for the better, however. Sure, EHRs allow physicians to redistribute their workload instead of being trapped at work where they were essentially held captive "because we didn't want to and couldn't take paper charts home," says Montgomery, a third-year internal medicine resident at Beth Israel Deaconess Medical Center. But the technology also means that now "there's never a cap on the amount of documentation you can do," he notes. While EHRs place vast amounts of patient information at the fingertips of physicians and nurses, the technology has done little to distill those data for providers, Montgomery says. "There's been little movement beyond making EHRs more than online filing systems for what would otherwise be paper notes, fulfilling little of the promise of digitizing health records," he says. Bill Galanter, MD, associate chief health information officer at the University of Illinois Hospital & Health Sciences System, recognizes how time-consuming EHR documentation can be. However, he believes implementing the technology can be time well spent, citing its ability to gather data more efficiently, support better decision-making, promote patient collaboration, and catch potential errors. Nevertheless, according to a time-motion study conducted by the American Medical Association (AMA) and Dartmouth-Hitchcock Health Care, physicians spend approximately one-half of their time inputting EHR data and completing administrative deskwork. The study, published in the Annals of Internal Medicine, found physicians spend 27% of their time on direct clinical face time with patients and 49.2% of their time on EHR and deskwork activities. In other words, for every hour of direct clinical face time with patients, physicians spend nearly two hours on EHR and administrative tasks. Outside of office hours, physicians spend another one to two hours each night on data-entry demands. That said, Galanter believes individual institutions are just as culpable as the technology itself for the excessive time physicians and other staff spend on EHR documentation. "EHRs allow (facilities) to have some control over physician workflow because it's easy to kind of stick more work into the workflow because of the way the EHR works. You can kind of force people to do things," he says. For example, with an EHR in place, organizations can forbid physicians from prescribing medications unless they complete an electronic form. "So you're kind of forcing them to do it. I think institutions often use EHRs to get doctors to do things they didn't in the past," Galanter adds. Galanter says poor EHR design can impact workflow, leading to squandered time. "EMR vendors are focused on selling the software, and those who purchase it are lately largely on the business side with a smattering of clinical input," he notes. Galanter laments the fact that, due to industry forces, EHRs must focus on more than just patient care. Specifically, the technology also must meet government requirements (financial and otherwise), improve billing, minimize liability, and enhance an organization's marketing. "If the government and insurers produced an environment where, financially, patient care was No. 1 and clinician satisfaction was somewhere in the equation, that's what those who make purchasing decisions would look for," he says. If that were the case, he believes EHR vendors would respond just like companies in other markets and develop products that reflect consumer demands. However, the incentives aren't currently aligned, Galanter notes. As a result, complaints about the amount of data entry performed by physicians will likely remain a bone of contention. Will their displeasure ever subside? "I believe it will, but it will take time," says Tam Pham, solutions executive at Apixio, a data science company specializing in health care. "Maybe there's a technology-savvy physician out there who is frustrated with it all but also understands the compliance and meaningful use–related challenges vendors face—and maybe they're building the solution right now. Or perhaps organizations will put greater pressure on their EHR vendors to ameliorate the data-entry concern up front." Raj Ratwani, PhD, scientific director and senior research scientist at MedStar Health's National Center for Human Factors in Healthcare in Washington, D.C., says EHRs change the way physicians typically carry out their clinical duties. However, he points out, in a RAND Corporation study sponsored by the AMA, physicians overwhelmingly indicated a disinterest in returning to paper. The study found that physicians approved of EHRs in concept and appreciated having the ability to remotely access patient information and achieve improvements in quality of care. However, for many physicians, the current state of EHR technology significantly decreased professional satisfaction in several areas, including poor usability, time-consuming data entry, interference with face-to-face patient care, inefficient and less fulfilling work content, inability to exchange health information, and degradation of clinical documentation. Along those lines, an AMA study with RAND confirmed that poorly designed EHRs and administrative obstacles are leading contributors to physician burnout. Collaborative studies by the AMA and Mayo Clinic found physician burnout to be a growing problem; 54.4% of physicians reported at least one symptom of burnout in 2014, up from 45.5% in 2011. By comparison, prevalence of burnout among the general working population was 28.4%. • Enhance physicians' ability to provide high-quality patient care. Effective communication and engagement between patients and physicians should be of central importance in EHR design. 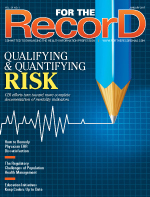 The EHR should fit seamlessly into the practice and not distract physicians from patients. • Support team-based care. EHR design and configuration must facilitate clinical staff to perform work as necessary and to the extent their licensure and privileges permit, and allow physicians to dynamically allocate and delegate work to appropriate members of the care team as permitted by institutional policies. • Promote care coordination. EHRs should have enhanced ability to automatically track referrals and consultations as well as ensure that the referring physician is able to follow the patient's progress/activity throughout the continuum of care. • Offer product modularity and configurability. Modularity of technology will result in EHRs that offer flexibility to meet individual practice requirements. Application program interfaces can be an important contributor to this modularity. • Reduce cognitive workload. EHRs should support medical decision-making by providing concise, context-sensitive, and real-time data uncluttered by extraneous information. EHRs should manage information flow and adjust for context, environment, and user preferences. "What that's really saying is because those systems aren't designed with end users' needs in mind, it puts an undue cognitive burden on users—they have to think about interacting with the system far more than they should," Ratwani says. "That message has been stressed to EHR vendors and other health info stakeholders for quite some time." • Promote data liquidity. EHRs should facilitate connected health care—interoperability across different venues such as hospitals, ambulatory care settings, laboratories, pharmacies, and postacute and long term care settings. This means being able to not only export data but also properly incorporate external data from other systems into the longitudinal patient record. Data sharing and open architecture must address EHR data "lock-in." • Facilitate digital and mobile patient engagement. Whether for health and wellness or the management of chronic illnesses, interoperability between a patient's mobile technology and the EHR will be an asset. • Expedite user input into product design and postimplementation feedback. An essential step to user-centered design is incorporating end-user feedback into product design and improvement. EHR technology should facilitate this feedback. Without question, these goals are noble. But what are the industry's prospects for actually accomplishing these objectives? "We're certainly seeing some advancement in EHR vendors and other stakeholders working to meet them," Ratwani says, while acknowledging that progress has been incremental. "I'm confident we're going in the right direction, but there's still lot of work to be done." Galanter is optimistic about the future of EHR design. "I think the industry's full of bright people, many of them motivated to improve patient care. Nothing's impossible about the AMA suggestions," he says. Pham believes the nature of the beast will force vendors to step up. "I believe EHR vendors are like most vendors where they pay heed to what industry requirements and federal mandates they need to comply with in order to be competitive," she says. "The competitive EHR vendors may say to you that their system meets all of the AMA's usability guidelines; however, it is the configuration and implementation of the system that makes it user friendly. The top EHR vendors have well-defined implementation plans." In any industry—health care or otherwise—Ratwani says product developers must keep users in mind or risk producing an unusable solution. "EHR vendors have to understand those needs. It makes business sense to do that because you want your end users to be satisfied with product," he says. Organizations or physician practices that invest in the leading EHR solutions do so for both the technology and the expertise of the people implementing the solution, Pham says. "The top three EHR vendors perform well in meeting AMA's usability guidelines likely because they've spent a significant amount of time in the implementation phase," she says. However, Pham notes that the costs associated with making upgrades may be considerable for small physician practices or groups. "EHR implementations in a hospital environment have the luxury of multidisciplinary teams from scheduling, to clinicians, to implementation managers and business analysts using the system. In a small physician practice, you just have the physicians themselves and their office staff who are too inundated with the daily burdens of running the practice to take the time to really think through how to configure an EHR to meet their specific needs," she says. Physicians looking to purchase an EHR must take into account the up-front implementation costs associated with configuring the system to their specific needs, Pham says, noting that these financials will be in addition to the vendor's implementation price tag. Getting it right up front will save time, effort, and money on the back end, she says. For hospitals, vendor selection is paramount; a mistake there can lead to serious consequences. "Your system just spent millions on a system and if you don't like it, it's difficult and costly to switch systems," Ratwani says. "That's why we have to be careful with how we talk about market incentives." Provider organizations end up having to account for a large percentage of any cost to switch EHR products, he notes. "I hope we see EHR vendors take stronger accountability and make it easier for institutions to switch products if they want to," Ratwani says. "We're seeing slow progress in how these systems are being designed to remedy those types of challenges." While it may be fair to question why these suggestions for EHR projects were not heeded in the first place, Pham says that's not necessarily the case, noting that many implementation teams lack the right clinical leadership, skill sets, and resources to make EHRs user friendly. "Everyone typically tries their best when they are part of a team that implements something new for an organization; however, oftentimes people on the team have full-time jobs that make it difficult for them to take a step back and consider new things," she says. Keep in mind that once a provider—particularly a large one—implements an EHR, it's customizing and modifying it based on its perceived needs, Ratwani says. "When that happens, sometimes the health care system does a disservice to its own product. They might be undoing the smart choices that the EHR vendor made." Ben Moscovitch, manager of HIT at The Pew Charitable Trusts, says researchers have found variability in the effectiveness of the testing EHR vendors conduct on their products during development. Given that variability and what it perceives to be insufficient testing requirements, Pew is pursuing enhanced EHR testing for safety, he notes. Pham believes physician satisfaction with EHRs will improve in parallel with the industry's ability to better use data. "Once we're able to integrate health care data, including payer data and analytics, across the continuum into EHRs, physicians will have the necessary data needed at the point of care in their EHR to take appropriate actions," she says. "In today's world, physicians are prompted for the same thing potentially over and over, and the alerts prompted may be outdated, causing frustrations or redundant care, resulting in waste." Improving usability requires those designing, implementing, and configuring EHRs to cull input from users, Galanter says. "They need to want to improve and find some way to build this into their processes and spend the time and money to make it happen," he says. Galanter recommends that any user criticisms be as constructive as possible. "They need to let their opinions be known without just nonconstructively complaining. There are many circumstances where vendors and information systems departments make changes to improve usability due to thoughtful, constructive criticism," he says. In the short term, vendors and IT departments must work toward integrating end users into their development and implementation plans. — Chuck Green is a freelance writer based in Chicago.